Lam Soon is the winner of the bizSAFE Progressive Award 2016, another recognition from Workplace Health & Safety Council (WHS), Ministry of Manpower. The bizSAFE Enterprise Progressive Awards recognise companies for their efforts in improving workplace health and safety under the bizSAFE programme. 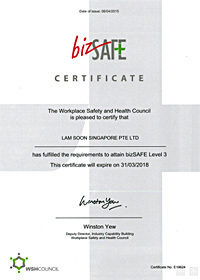 Lam Soon has progressed from level 1 to level 3 within six months of attaining bizSAFE level 1.